> Adobe > THE ART OF INTEGRATION. Blend online and offline data to create a vibrant marketing world. Integrate your data to dive beneath the surface. It’s amazing how online and offline data remains disconnected. Sculptor and conservationist, Jason deCaires Taylor knows the benefits of connecting two different worlds. 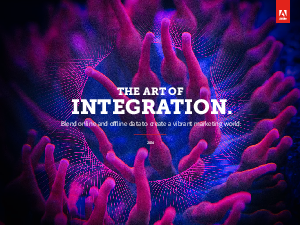 In our guide, The Art of Integration, you’ll see what marketers can learn from the symbiotic relationship of Taylor’s sculptures on the floor of Molinere Bay. Read the guide to learn how to piece together all your insights and interactions into a whole view of your customers, so you can create seamless experiences with them.